Autumn with you today to share a fun little Distress technique with the gorgeous Garden Background die. I have had this concept in my mind for some while and attempted it previously with no success. This time I carefully thought out the concept before beginning. Because gesso resists Distress Ink, I gessoed my watercolor background panel completely. Next, I applied Mod Podge to the back of my uncolored background cut out, making sure not to let the adhesive seep too much. I rubbed it onto the gessoed panel to adhere and let it dry. I dipped the panel into various Distress Ink puddles, lightly drying along the way, and reinking as needed. You can see that some ink lightly absorbed in the background, but soaked through the die cut. When I was happy with the inking, I gave the panel a few sprays of Perfect Pearls spray in a green hue. After I dried that, I coated the entire panel with a light brush of Mod Podge to seal. My mistake the first try was to apply Mod Podge all over before inking - doh! I used this sweet vintage image and a small talk sticker sentiment to finish off the card. I cannot wait to try other ink colors and layouts with this technique. I would love to see your projects if you try this technique. I hope it inspires you! 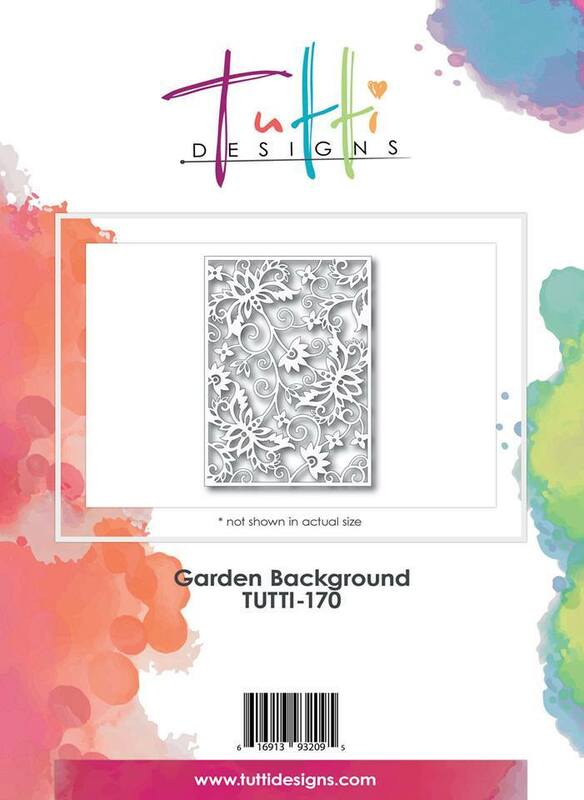 Purchase your Garden Background die today HERE! GORGEOUS creation Autumn! Thanks for sharing this awesome technique ... looks FABULOUS on this die cut! Wonderful inspiration ... thanks! A great technique and I really love the finished result! Perfect with that sweet little relative and beautifully finished! Stunning card Autumn, and a great technique - I might just have to try it, but I don't have a die cut that big, but I am sure I can find something to use...! I didn't realize gesso would resist the ink to this extent! How interesting - will keep that in mind! Loving the effect! Color me INSPIRED! Well now I have got to add that die cut to my wish list AND give your technique a try! Looks fabulous! Hugs! Wonderful idea and execution. That die is on my wish list and now I have to try your technique. So fun! Thank you for sharing. Great tutorial--another technique I want to try! Thanks, Autumn!